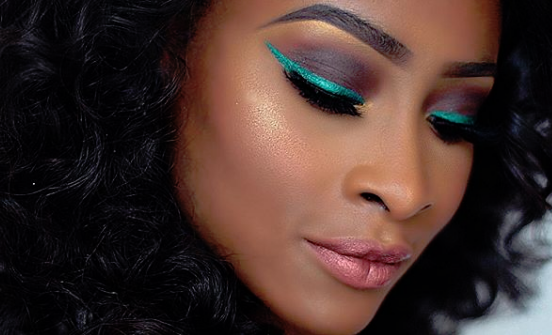 Women of color often times worry about wearing eye-shadow colours that are too bright or if they they do wear them, the colours won't be as popping as they should as compared to fair skinned women. With this trick you can get even the dullest colours to look like they are highly pigmented. I am currently a big fan of the Shocking Bright pink eye-shadow that I put it on almost everyday. How I Wear It: A soft, shimmery pink is easy to use for creating a pretty wash of color on lids, but don’t fear turning it up a notch with fuchsias. Swipe intense matte powders onto your lids or brush creamier formulas up onto the browbones. Either way, you may want to consider lighter brows and lashes and a pale matte pink lipstick for a finishing touch. Turn the intensity of your eyeshadow up a notch by adding a white base to your lids so that the pigments have a proper base to cling to. Matching your eyeshadow with your clothing might make you end up looking more like an actual pea than anything else. Avoid overly matching your eyeshadow look to your outfit if you're intimidating by bright shadows and want to ease into it. In order to avoid the clown makeup look, make sure to blend your bright eyeshadow to avoid any harsh lines. Here is a video below from American YouTuber Youkeyy where she teaches us how to achieve these bright colored looks.